“Wait and see” seems to be the catch phrase in Alberta real estate circles these days, as companies try to get a handle on how big an impact this year’s drop in oil prices will have on the market. “Things are a little bit quiet here on the leasing front and the investment front,” said Garry Beres, executive vice-president for CBRE in Calgary. An increase in unemployment brought about by the downsizing of energy companies is being most felt where their headquarters are located in Calgary, which is experiencing an increase in the amount of available office space. The vacancy rate rose to 11 per cent in the first quarter of this year from 8.5 per cent in the previous quarter. The absorption of vacant office space had already begun to slow at the end of 2014 and is expected to decrease further in 2015. “There’s definitely been a lack of overall transactions in all sectors, but it’s more pronounced in the downtown office sector,” said Colliers International Calgary managing director Laurel Edwards, who believes rental rates will decrease due to increased office space availability. 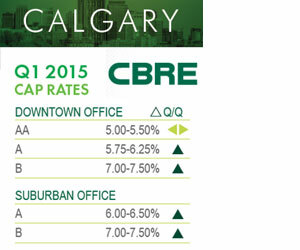 Capitalization rates for downtown office space remained stable and ranged from 5.5 to 6.25 per cent for class-A properties and rose to from 6.5 to seven per cent for class-B buildings, according to Colliers International’s recently released first quarter cap rate report for Calgary. Suburban office cap rates held steady at from 5.75 to 6.5 per cent for class-A and increased to from 6.75 to 7.25 per cent for class-B properties. “Probably for all sectors, but definitely for downtown office, we were starting out at historic cap rate lows,” said Edwards. “So the cap rates that we’re stating here are considered to be quite low and have been there for a while. CBRE’s Beres said a lack of availability has slowed down office building investment in the suburbs. The industrial, retail and multi-residential asset classes are expected to continue to perform strongly and draw investor interest throughout the year, with rental rates and overall demand expected to remain stable — particularly for high-quality, well-located properties. Cap rates are forecast to remain stable throughout 2015, which is considered to be positive based on how low they’ve been for the past year. Cap rates for class-A industrial properties rose slightly to a range of 5.5 to six per cent, while the rates for class-B have bumped up to from 6.5 to seven per cent, according to CBRE’s recently released “Canadian Cap Rates & Investment Insights” report for the first quarter. Cap rates for the retail sector were steady across the board and varied from 5.25 to six per cent for regional malls and power centres, from 5.5 to 6.25 per cent for the community category, and from six to 6.75 per cent for strip malls, according to Colliers’ report. CBRE’s report shows cap rates for apartments ranged from 4.25 to 4.75 per cent for class-A high-rise and low-rise buildings and from 4.5 to five per cent for class-B high-rise and low-rise properties. Real estate investment was quiet for the first three months of 2015 in Edmonton, and new construction will add a sizable amount of office space to the market in the coming months. “It gives a lot of existing tenants in the Edmonton office community lots of opportunities to go out and acquire new space, expand and move around,” said Colliers Edmonton managing director Andrew MacLeod. “Those opportunities haven’t always been available in Edmonton because there were so few large spaces available to move into. Office cap rates remained largely unchanged, as buyers and sellers delayed investment decisions. CBRE’s report showed they ranged from a low of 5.5 per cent for class-AA buildings to a high of 7.75 per cent for class-B properties downtown. Suburban office rates varied from a low of 6.75 per cent for class-A to a high of 7.75 per cent for class-B. 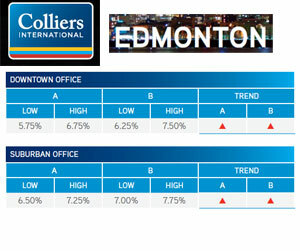 Edmonton’s industrial cap rates remained steady, with Colliers reporting a variance of from 5.75 to 6.5 per cent for single-tenant A properties and from six to seven per cent for multi-tenant B buildings. “We still feel that there would be a significant amount of demand for a stable class-A industrial asset in Edmonton, but like all asset classes in Edmonton, there’s not a lot of good quality assets available,” said MacLeod. There has been strong growth in multi-residential rental rates and an accompanying decrease in vacancies in Edmonton in recent years, and growing demand has meant a few significant rental properties are either planned or underway. They’ll add to the supply of high-end, high-rise buildings, of which the city has a shortage. Cap rates ranged from 4.5 to five per cent for class-A high-rise apartments and from 4.75 to 5.25 per cent for class-B high-rises, according to CBRE. Class-A low-rise rates were between 5.25 and 5.75 per cent and class-B low-rise rates varied from six to 6.5 per cent. Retail vacancy in Edmonton is less than two per cent and strip centres continue to be highly sought-after properties, as rental rates remain high. Retail cap rates were stable and ranged from 5.5 to six per cent for regional malls and power centres, from 5.75 to 6.5 per cent for the community category, and from 5.75 to 6.25 per cent for strip malls, according to Colliers’ report.